Irish 082 Five Years Apart—Same Job. 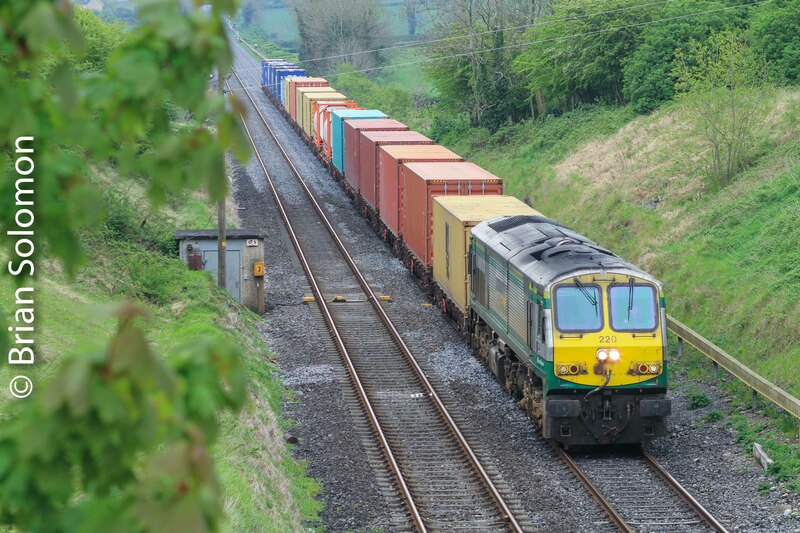 Irish Rail operates International Warehousing & Transport (IWT) container liner freights five to six days per week between Dublin Port and Ballina, County Mayo. On 3 October 2013, Colm O’Callaghan and I photographed Irish Rail 082 working the down IWT Liner at Clondalkin on the quad track section of the Dublin-Cork line. Back then the locomotive wore the now obsolete black, silver and yellow ‘freight’ livery. 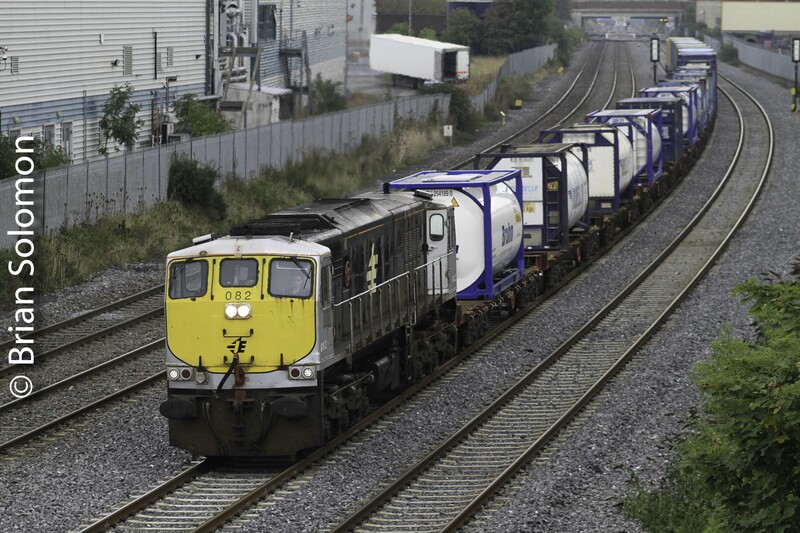 Five years ago: Irish 082 on 3 October 2013 working down road at Clondalkin. Exposed using a Canon EOS-7D with 200mm lens. On 1 October 2018, two days ago, I caught the very same locomotive working the up IWT liner at Blackhorse Avenue in Dublin. It’s now in battle ship gray paint, as are most of the 071s, except numbers 071 and 073 that are dressed in heritage paint. 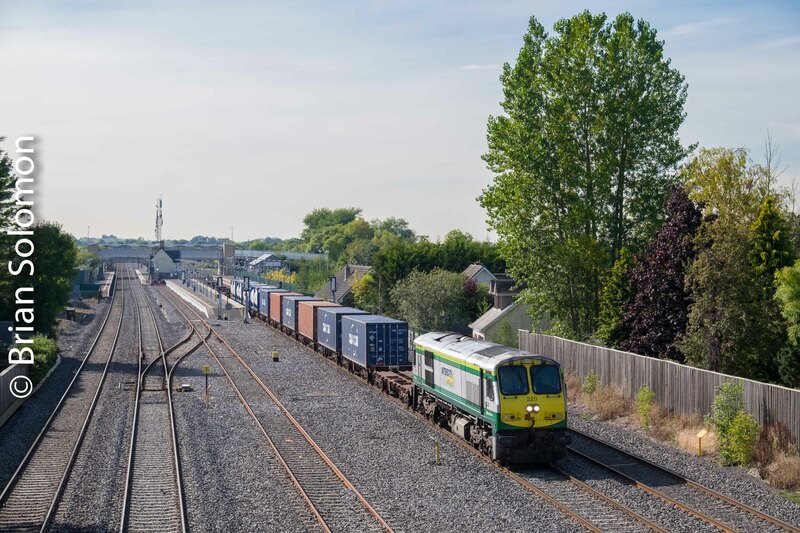 Irish Rail’s up-IWT liner approached Blackhorse Avenue on 1 October 2018. Exposed digitally using a FujiFilm XT1 with 90mm telephoto lens. Notice how I’ve exposed for backlighting and used the arched bridge to frame up the train, while minimizing the effects of a bright sky. Image adjusted in post processing for contrast, exposure and colour saturation. Working With Glint: Cherry Orchard and a Late Running Liner. 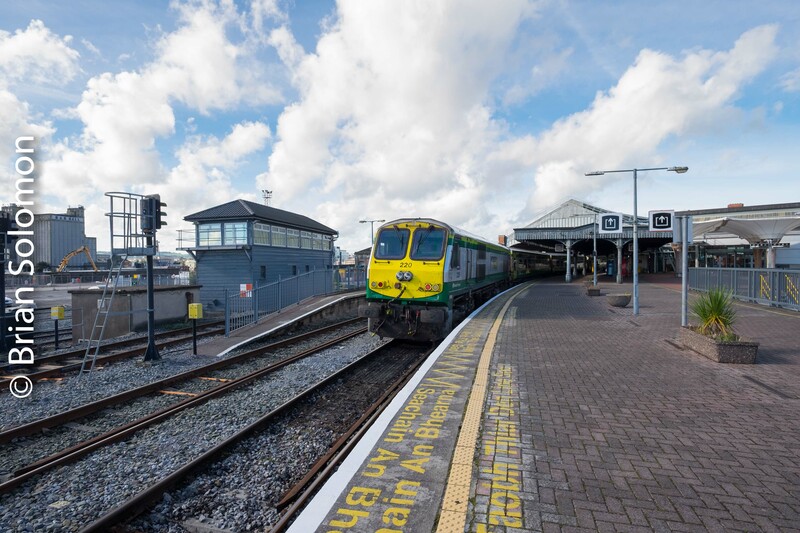 Last week, Irish Rail operated a late IWT liner that departed Dublin in the evening, instead on its normal mid-morning path. A group of my friends went to Cherry Orchard in the west Dublin suburbs to capture this relatively unusual move. 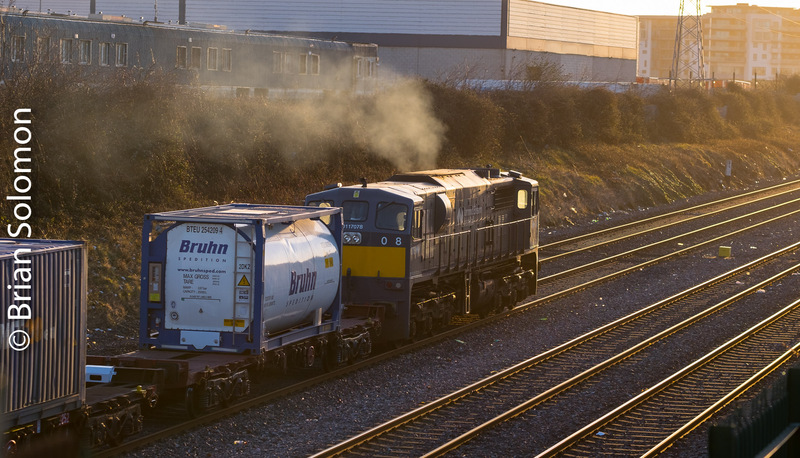 While waiting for the freight, I made views of the evening passenger parade. 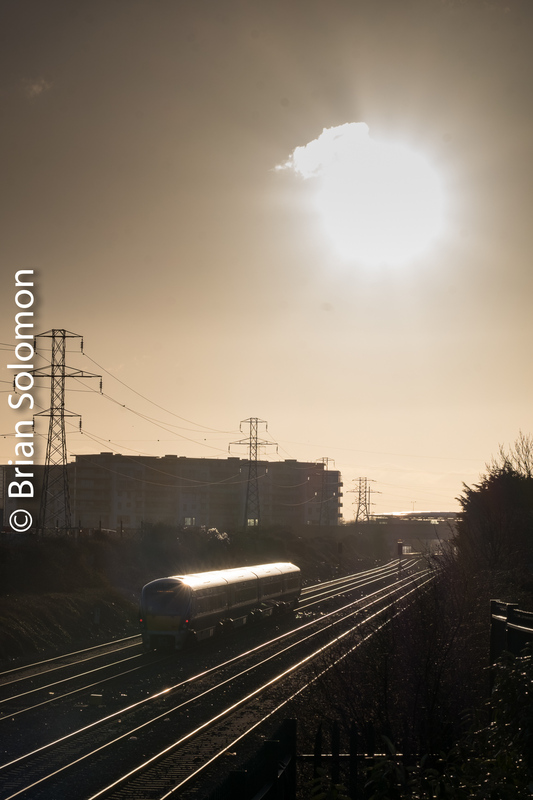 The sky was clear of clouds and sun was aligned with the Cork line making some interesting possibilities of glint and silhouette photographs. In the 1990s, I exposed hundreds of images in this type of dramatic lighting conditions. The characteristics of Kodachrome 25 slide film made it well suited to glint photographs and I had my K25 exposures refined to a high art. Glint photographs are more difficult to capture digitally, and I find that I have to control contrast and use digital masks/digital applied graduated neutral density filters in post processing to obtain the results that I expect. An up-cork with a Mark 4 push-pull set catches the evening glint at Cherry Orchard. I made this view of a down road Intercity Railcar from the north side of the line. 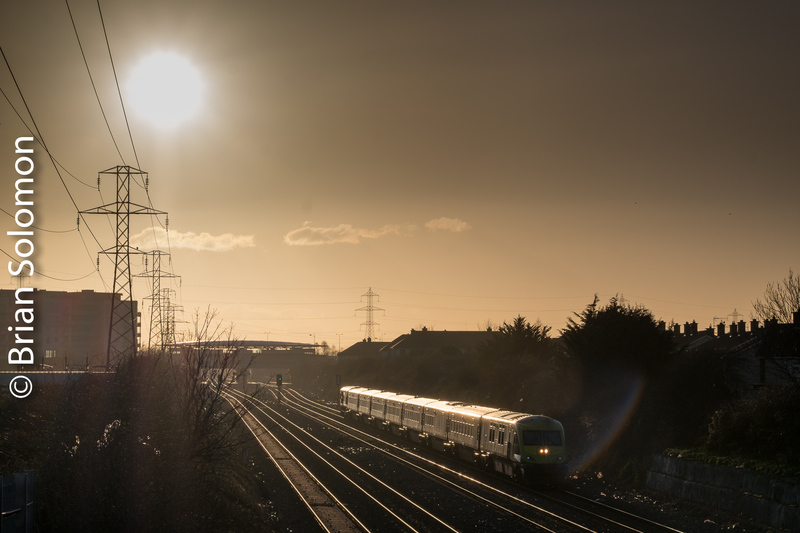 Irish Rail’s IWT liner roars toward the setting sun. Glint light is an excellent means of capturing the drama of railways in motion. Key to this exercise is underexposing a raw file sufficiently to retain detail in the sky and glinty areas of the image, than lighten shadows while making localized highlight adjustments in post processing. These photos were made using my FujiFilm X-T1. Portrait view of Irish Rail 081 at Islandbridge Junction. 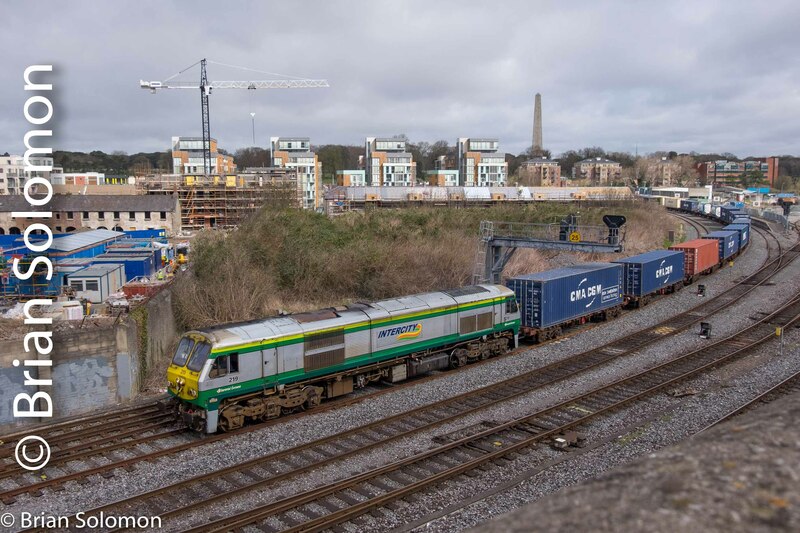 On the morning of 27 March 2017, freshly painted Irish Rail class 071 locomotive number 081 worked the down IWT liner. I made the time to catch this from my often photographed location at Islandbridge Junction near Dublin’s Heuston Station. Among the advantages of this spot is good morning lighting on westward trains (where most other places face difficult backlighting), ample elevation and the iconic Wellington Testimonial, which is located in the Phoenix Park on the north side of the River Liffey. 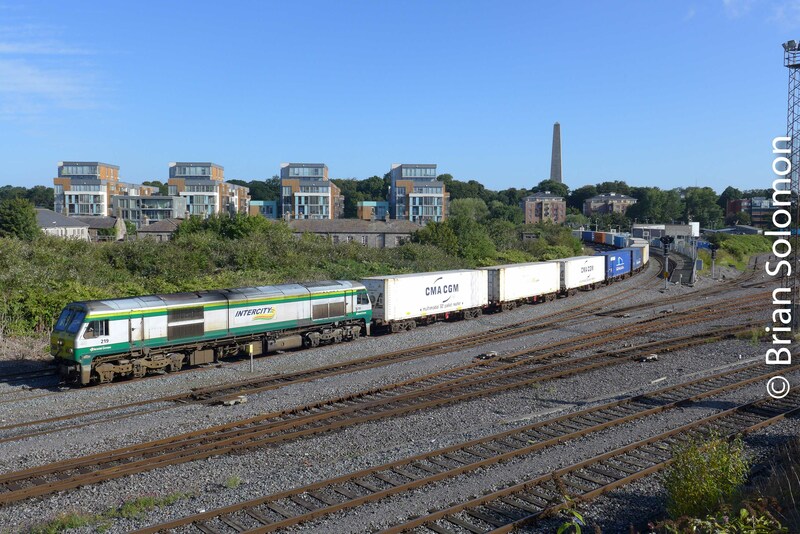 Irish Rail Container Pocket Wagons pass Islandbridge Junction. So do you go out in poor light to catch something unusual? That’s your choice. Sometimes I hold off for fine weather or good light to make images. Other times I’m faced with catching something in prevailing conditions. The railway doesn’t run for sunshine. 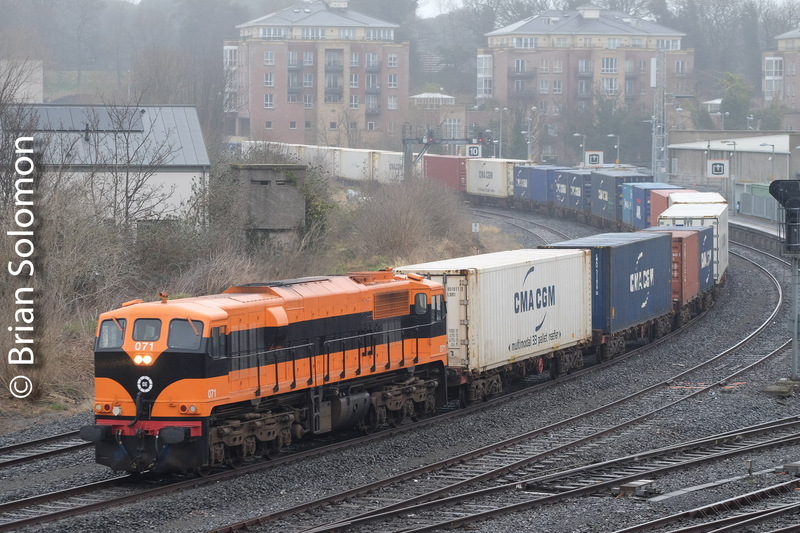 Once a week Irish schedules an extra IWT Liner (International Warehousing & Transport—Dublin North Wall to Ballina, Co. Mayo). In recent months, this has operated with the elusive container pocket wagons (CPWs). But it doesn’t necessarily run every week. 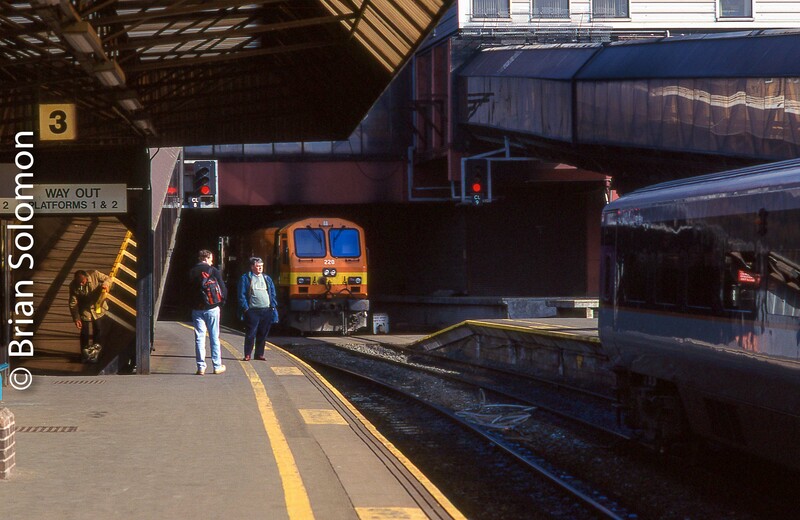 I have plenty of photos from Islandbridge Junction, and no shortage of images depicting the IWT Liner, and while I’ve photographed the CPWs over the years, last week I knew for certain (that’s railway certain, which is at best uncertain) that the CPWs were on due to pass. So despite flat light, I made the effort. Irish Rail 075 leads the IWT Liner at Island Bridge Junction, Dublin. Lumix LX7 photo. Exposed on Tri-X using a Leica IIIA with 50mm Summitar. Processed with two stage developer plus selenium toner. Alternate Angle at Islandbridge Junction; Irish Rail’s IWT Liner. 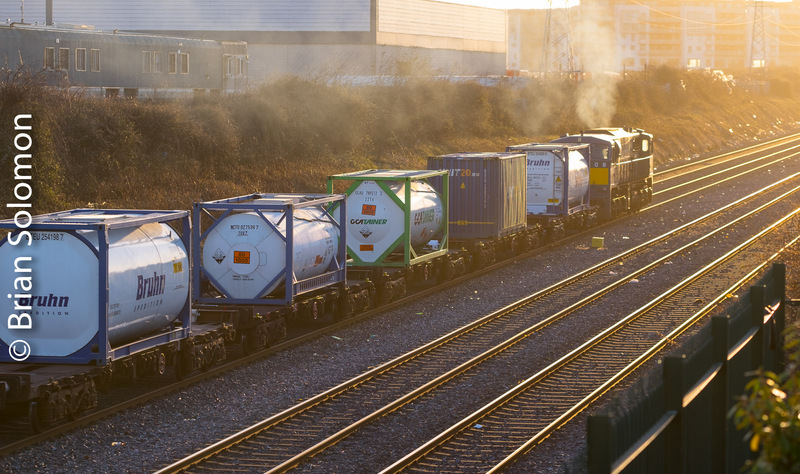 Thursday, 7 April 2016, Irish Rail’s IWT Liner was blocked at Islandbridge Junction. This gave me the opportunity to work some less common angles in addition to my common viewing point (often featured on Tracking the Light). Irish Rail 219 with Dublin to Ballina IWT liner. By holding my FujiFilm X-T1 above my head at arm’s length and tilting the camera’s live-view panel screen downward, I was able to make this view looking over the wall at the St. John’s Road roundabout in Dublin. Why not try this more often? Simply because I’m not tall enough to see over the wall, so to make this view I’m actually using the camera to view the scene. It’s tiring work to hold a camera above your head while waiting for trains to appear. An Irish Story: Sun and Clouds, Anticipating the Up-liner and the Light. Lately the sun has been an elusive orb in Irish skies. Too often, I awake to find a slate gray dome above me. Good Friday (25 March 2016) was different. It was bright sunny morning. Having the sun and making use of it are two different things. In the early afternoon, Colm O’Callaghan, Ciarán Cooney and I waited at Lucan South, just east of the Adamstown Station on the quad-track in suburban Dublin. 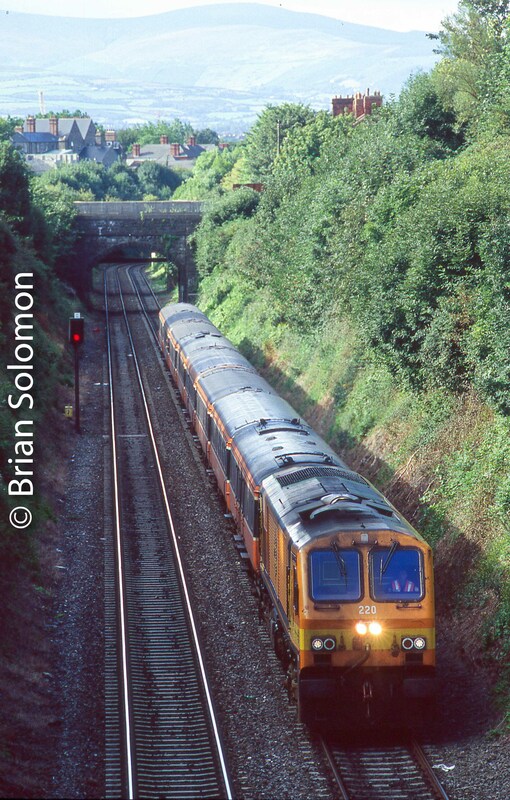 Our quarry was the up-IWT Liner from Ballina, which was operating with Irish Rail 233, the last 201 class diesel in the old Enterprise-livery. We caught this engine before, but it’s unlikely to survive for long in this old paint. Looking south at Lucan South. Puffy white clouds dot the sky. Nice to have for texture, they can make getting a clean photograph difficult when they block the sun. An Irish Rail ICR races along on the down fast; this is a trailing view. You can see how a bit of cloud shadow darkened the mid-portion of the train. Hmm, will that cloud get out of the way in time? If it doesn’t who can we blame for it? I’ll be naming names. Anxiously, we watched the signals, and the passing InterCity Railcars. The tapestry above was becoming a maddening mixture of fluff and blue. The IWT Liner approaches. You can see Adamstown Station in the distance in full sun. A muddy black shadow mucks up the foreground. Would we get the liner in full sun? After all, that’s what we were out for. With two cameras around my neck, I was prepared for either eventuality; if it was cloudy, I work with the digital camera; but if the sun came out bright, I’d make a slide. To this aim, I’d set my Canon EOS-3 at f4.5 1/1000th of a second—my full-sun setting for Provia 100F. It was a photo finish. As the liner approached the light changed from dark to light. I made some telephoto views with the FujiFilm X-T1; but as the IWT liner reached us the clouds began to part and I exposed a single frame of Fujichrome with my Canon. That photo remains latent in the camera. Did I get it right? It will be some weeks before I know the answer; I wont have the film processed until May. As the freight rolled into view the clouds receded. I made this dappled-light photograph digitally. To retain a bit of detail in the sky, I have a graduated neutral density filter in front of my lens. The winning view will be my colour slide exposed using a 40mm lens. I hope I got the exposure right. Irish Rail’s IWT at Islandbridge Junction; Lee Graduated ND Filter Experiment. Last Friday, 11 March 2016, I went up to my favored Irish local location; Islandbridge Junction. This is a handy place for me. 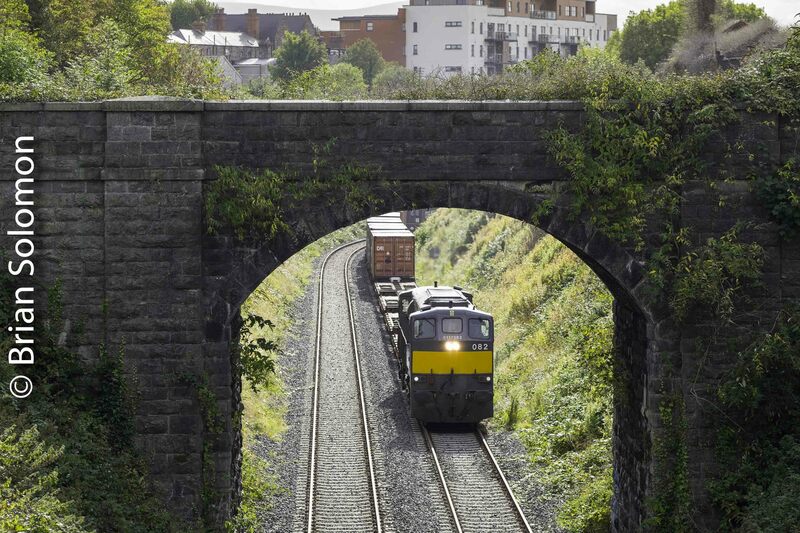 This is great place to catch a freight train exiting Dublin’s Phoenix Park Tunnel on a bright clear day, yet can be visually problematic on a dull day. On this day, I thought it would be a good place to experiment with a Lee graduated neutral density filter as a means of controlling contrast and allowing for a more effective overall exposure. The filter I use offers subtle 2/3s of a stop gradation. This is adjustable both up/down and rotationally left/right. I made a few test photos with and without the filter to gauge my exposure before the IWT arrived with Irish Rail 088 in the lead. A similar effect can be accomplished digitally, yet the digital effect doesn’t add information to the RAW file, but only makes a visual adjustment in the final image. In other words to apply the filter digital may be viewed as a ‘correction’ rather than an in-camera technique. Yet, it is often easier to apply a filter in post-processing than in the field. I’ve used both methods depending on the circumstance. Test photo to gauge comparative exposure. This was made without the filter. My concern is getting adequate exposure in both the sky and foreground. Test exposure with the graduated filter. Here I’ve been able to lighten the foreground slightly while holding detail in the sky. Here we have the ultimate objective. 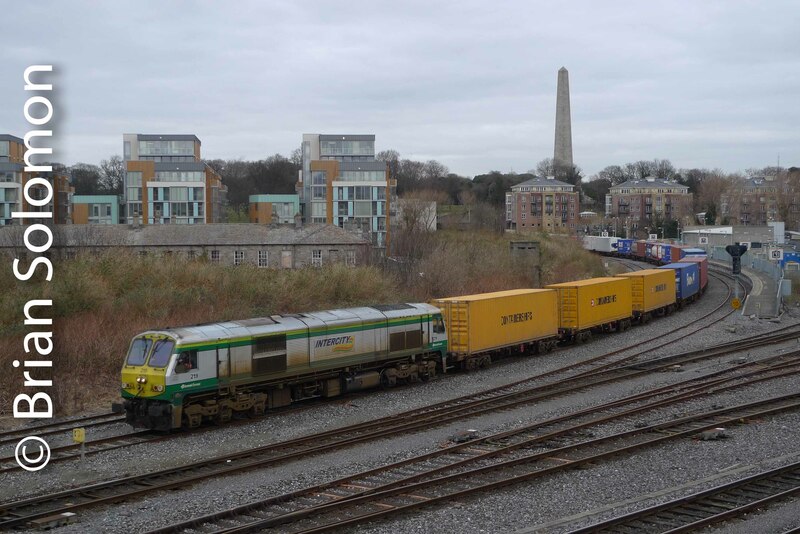 To make a balance image of Irish Rail’s IWT Liner. It really about making the most of a gray engine on a gray day. This gives a nice overall of my experiment, but in the middle of all this I got a little greedy. Using my zoom lens on the FujiFilm X-T1, I made a tight view of the IWT (with the filter). As is often the case with last second changes, I didn’t get my exposure quite right. My feeling was that the RAW file was about 1/3 of a stop too dark. Nice try, but my exposure was a bit dark. I imported my RAW file into Lightroom and made a variety of small corrections. First I altered the level. I also lightened up the entire image slightly and warmed up the color temperature. Is this an improvement? As with most of my photography, I consider this a work in progress. In all likelihood, before long I’ll be back at Islandbridge Junction to further refine my experiment.